I found this nifty little clock that covers everything from the current world population to how many bicycles have been produced. The figures are fascinating and mind blowing at the same time. It does tell the time too. How time flies! There is a great video and two articles in The Atlantic, January 2008 issue on fonts and typography. The first article, Playing to Type by Virginia Postrel, discusses the use of fonts today and type design. It offers a great background on typography in the digital age. The second article, What’s in a Font? is an interview with Gary Hustwit, the director of Helvetica, about his making of the documentary on the font. The interview gives some background into how and why this film was produced. 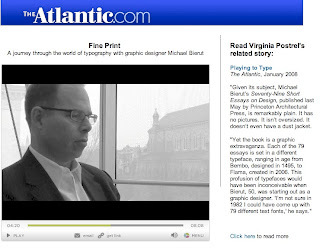 The video, Fine Print presents comments on typography by Michael Bierut of Pentagram. The video is well produced, talks about the use of fonts and gives insights into the choice of fonts for Michael’s recent book, Seventy-Nine Short Essays. 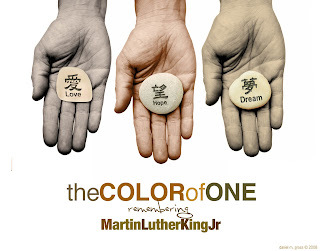 The Color of One, Remembering Martin Luther King Jr.
Today we celebrate the life of Martin Luther King Jr. (January 15, 1929 – April 4, 1968). Rev. King was fundamental in the civil rights development of our country. Today I challenge all designer to create a “Color of One”. Together we can use our craft and passion to continue the forward progress that Martin Luther King Jr. started those many years ago. Great progress has been made but we still have room to grow and improve. 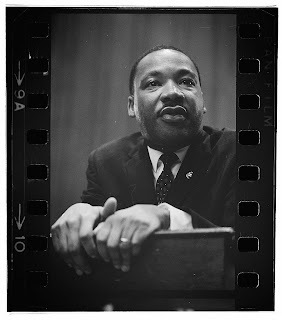 May Martin Luther King’s dream of peace, equality, hope, and love become a part of our everyday life. Prior to graphic design as we know it today, back in the 18th century it was the printer’s job to “design” the layout, choose the proper fonts, illustrations and bind it all up. January 17th marks the birthday of one of America’s greatest printers, innovators, and statesman. 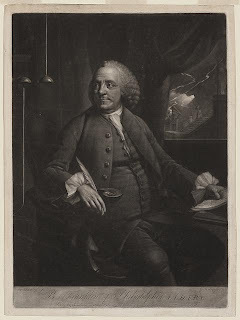 This great printer and thinker was Benjamin Franklin. Ben Franklin was born in 1706 in Boston. The fifteenth of seventeen children, Ben learned the art of printing from his older brother James who published a weekly newspaper. At 17 he moved to Philadelphia and started his own print shop in 1728. Franklin become known and trusted for his quality of work, excellent layouts and craftsmanship. As Franklin’s reputation grew the requests came for his skills. 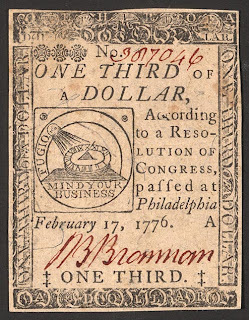 Early currency was designed and printed by Franklin for Pennsylvania, New Jersey and Delaware. Even back in the 1729 Franklin devised the use of mica in the paper and leaf imprints as ways to foil counterfeiters. In this same year, he started Philadelphia’s second and most prominent newspaper, Pennsylvania Gazette. 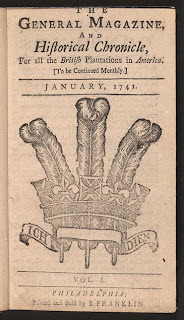 Franklin also designed and published one of America’s first magazines, General Magazine in 1741. His magazine lasted for 6 issues. Franklin continued to own and run his printing business but turned his time to other interests. Some of Benjamin Franklin’s interest included America’s first volunteer fire department, subscription library, public hospital, and property insurance company. Pennsylvania’s first college, the University of Pennsylvania was also helped in its founding by Franklin. Franklin was one of America’s greatest statesman and ambassador. He assisted with writing the Declaration of Independence and was a signer. Franklin also signed the Constitution in 1787. Benjamin Franklin is known for being an inventor. Thank Ben for bifocal glasses and his experiments with the kite in storms that lead to lightning rods. Benjamin Franklin died on April 17, 1790 in Philadelphia. To learn more about Franklin visit an excellent on-line exhibit at the Library of Congress website called Benjamin Franklin …In His Own Words. In the upcoming months there are two great series of stamps on design being issues in the US and in the United Kingdom. The first one is focused on the design greats, Ray and Charles Eames. The USPS will release a series of 16 stamps that showcases their contributions to design. Some of the images includes the Eames lounge and ottoman, the LCW chair, the LTR table, the Stackable Molded Chair and the Eames House in California. 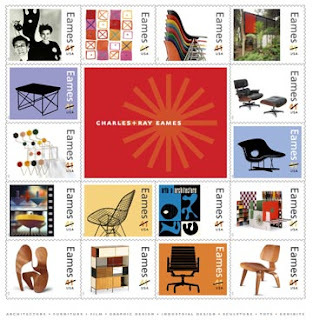 Ray and Charles Eames have created some of the most famous mid-century designs and it is wonderful to see them honored with this series of postage stamps. The stamps where designed by Derry Noyes for the USPS and will be for sale over the summer. For further information on the stamps visit the USPS. To learn more about Ray and Charles Eames, visit the Eames Foundation. 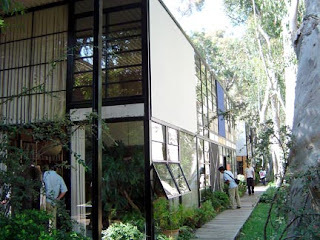 The Eames Foundation has information on visiting the Eames House, Case Study House #8, which is located just north of Santa Monica, CA and was recently listed as a National Historic Landmark. The visit is worth the short trip if you are in the area. The second series of stamps is from the Royal Mail, UK to celebrate the 100th anniversary of the birth of the James Bond creator, Ian Fleming. The stamps are designed to be extra long to show cover designs for the novels from the first issues in the 1960’s to current editions. The designs are for Casino Royale, Dr. No, Goldfinger, Diamonds are Forever, For Your Eyes Only and From Russia With Love. The stamps are available from the Royal Mail now and are designed by A2/SW/HK. If you are on that side of the pond let me know, I would love to get a post using the Bond stamps. 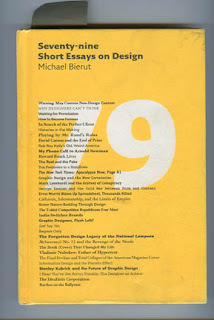 Seventy-nine Short Essays on Design by Michael Bierut is an assortment of his writings over the past few years. Michael is one of the founders of the wonderful design blog, The Design Observer and a partner at Pentagram. His book is composed of many of the essays he has written for the blog. The great part about this publication is the insight Michael gives us on our profession. The 79 essays cover Michael’s observations on history, design and other, politics, design criticism and social commentary. Once you pick up the book, you will find yourself carrying it around, trying to find a few minutes in the day where you can read the next essay. 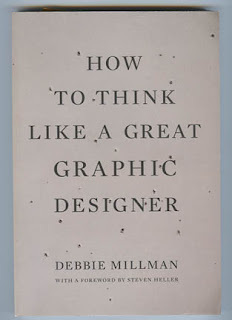 How to Think Like a Graphic Designer by Debbie Millman is a collection of interviews of some the great designers of our profession including Milton Glaser, Paula Scher, Stefan Sagmeister, Chip Kidd and Massimo Vignelli. Each interview gives you a glimpse about each designer, from how he or she got started years ago, to what’s important to them, and how he or she works. The questions are insightful and thoughtful. Debbie is the hosts of the Internet radio show Design Matters with Debbie Millman on the Voice America Business Network and a partner at Sterling Brands in NYC. Gary Hustwit actually pulled off a documentary film based on a font. 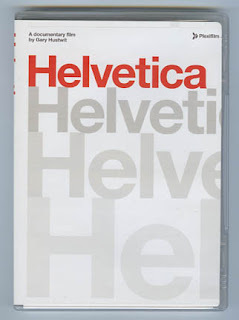 Helvetica is a history of how the font was created and its huge impact and use since its design in the 50s. The film interviews many innovative designers from around the world about Helvetica and shows how we use it everyday. The film is well paced, has a great sound track and is a great history lesson of our design world. Get your passion going, may your new year be full of great designs and be happy and safe.